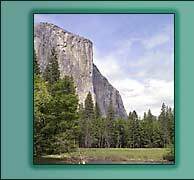 Bearclover.net - showcasing many Yosemite pictures, scenic California photos, portrait art, Photoshop graphics, and pottery. This is mostly a "photos" site. Lots (and lots) of photos from California's Yosemite National Park. I offer some Yosemite Wallpaper for your computer desktop. Also, I am showcasing many photos that I have taken all over my home state of California. Scenes photographed up Hwy. One, Hwy 101, the Salton Sea, and Sequoia National Park. There's also a California Poppy page, and some pages dedicated to Disney's new theme park, California Adventure. And so much more. I even have a "Travel Diary" page, which has (you guessed it) travelogues of some of my California road trips. I've even branched out and now have some of my scenic photography available on t-shirts! 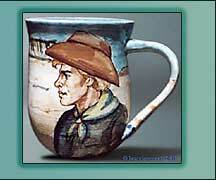 Since I am a potter and artist, I also have a pottery and art section on this site. (And I combine my love for art and Yosemite by painting watercolors of Yosemite on location!) And then there's my interest in digital art - so, I've made a special section - about Adobe Photoshop! 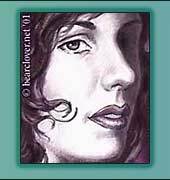 I explore basic techniques, and show off some Photoshop portrait art I have created. After September 11, 2001, I was inspired to start working on an "America the Beautiful" section. It showcases photos I have taken in other parts of this lovely country I live in. I also have created a wallpaper section, which has some scenic wallpaper with a patriotic theme. I just thought it would be something nice to do. As with every site on the web, Bearclover.net is perpetually in a state of flux - more photos being taken, more artwork and pottery being created. And it'll all eventually end up here. What is "bearclover," anyway ? Bearclover (or as my dad called it, "Bearsclover") is a plant that grows in abundance in the Sierras, and around Yosemite National Park. It has a unique fragrance, and has been said to be a sort of "catnip" for bears. Either you like the smell of bearclover (which you cannot miss as you drive around certain parts of the Park) or you don't. Everyone in my family likes bearclover, and is very sentimental about it. It brings back some great memories. I just thought it would be a good name for a Yosemite-intensive web site! Much thanks to W. Thompson for his Mighty Fine design of my email graphic! Checked in PC & Mac, w/ Netscape 4.75, IE 5, Opera, and iCab. Best viewed with a computer and a color monitor! Patriotic graphics from my sister site, Delicateflower.org.